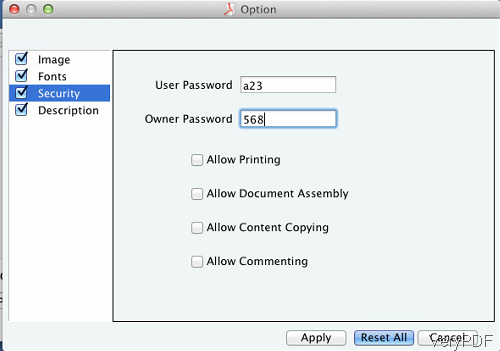 ← How to split password protected PDF into single page PDF under Mac system by command line? When you need to compress image PDF and set password to protect it under Mac system, the following article will be helpful for you. In this article, I will introduce software VeryPDF PDF Compressor for Mac, by which you can finish this task easily. Meanwhile, this software has user friendly software interface, so you can master its usage in a few seconds. Please check more information on homepage, in the following part, let us check how to use this software. All the software of VeryPDF software is free downloading and trying, so you can rest assured to download and use this software free. Please go to Try and Buy website to download the proper version according to your computer system and needs. Here I will take the PDF Compressor for Mac Single Personal User License for example. When downloading finishes, there will be an .pkg file in downloading folder. Please install this software by double clicking the .pkg file and following installation message. When installation finishes, there will be message reminding you. Then please click go to Finder then go to Application to launch this software. The following snapshot is taken from software interface, please have a check. Please click button Add to add PDF file to software interface. This software allows you to do batch conversion and there is no input size limitation. Once adding finishes, the added PDF file will be shown on the software interface with file path and file size. Please click folder icon on the software interface to choose the output folder. Once you register it, the register icon on the software interface will disappear. Click button Option, then you can will see the following snapshot. When you need to set password to output PDF file, please go to Security tab, where you can set user password, owner password and disable printing, document assembly, content copying and commenting. When compressing image PDF, this software is extremely good as it allows you to compress image from three kinds: color image, grey image and mono image. And under each compress image methods, there are Auto, ZIP, RLE, JPIG2, CCITT Group 4 ,JPEG and other image compression methods. In the fonts tab, you can compress fonts when compressing text based PDF file. In the description tab, you can add basic information to PDF file. Meanwhile here you can also convert PDF to PDF/A. Click button Start to run the compression process. A few seconds later, you can check the output PDF file in specified output folder. By this software, we can compress image PDF well and set password to protect it under Mac system. During the using, if you have any question, please contact us as soon as possible.